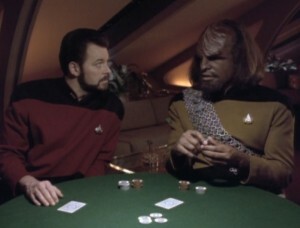 Riker and Worf experience déjà vu, or nIb’poH in Klingon. I grew up watching Star Trek and still have a special fondness for it. The show has been known for its social commentary, from one of television’s first interracial kisses to an examination of LGBT rights back in 1992. With science fiction as its vehicle, the franchise was a venue for a variety of thought experiments. It may have also presented an allegory for samsara, the cycle of death and rebirth. In Cause and Effect, the crew of the Enterprise are caught in a loop of time, repeating a day over and over that ends in the explosion of the starship. They experience déjà vu, hear the voices from past iterations, and can predict cards dealt in a hand of poker. Investigation (and several more iterations) reveals their predicament, as well as a way of relaying a short message to themselves in the next loop via the android Data. In another run, Data “subconsciously” manifests the number 3 in a variety of circumstances, including the poker game. He later interprets these “synchronous” events as the message that helps the Enterprise escape the loop. So, hello, mama, welcome me back. Though almost certainly unintentional, the episode also provides a handy metaphor for my theory about “hacking” the death-rebirth cycle. Using a piece of technology, Data is able to send a message to his future self. This message doesn’t manifest obviously; instead, it unfolds in a sequence of synchronous events that he eventually interprets as the key to the crew’s freedom. Similarly, my soul has designed messages for my current incarnation in the form of synchronous events, interpreted as signposts for the path I should travel. ~ by Grant on August 6, 2012. Re-in car-nation is what happens when we all drive used cars. Yosemite Same gets mad about the same thing over and over again when it is Re in tar nation! Glad you are back from D.C. I remember LOVING That episode, and now I know why. 😛 <3 you grant.